As iPhone revenue soars, Apple’s iPad sales dropped 18 percent year-over-year in the final quarter of 2014 and has now hit a plateau, according to a new study from Forrester Research. Even the new iPad Air didn’t help. But it’s not just Apple’s device that slipped. 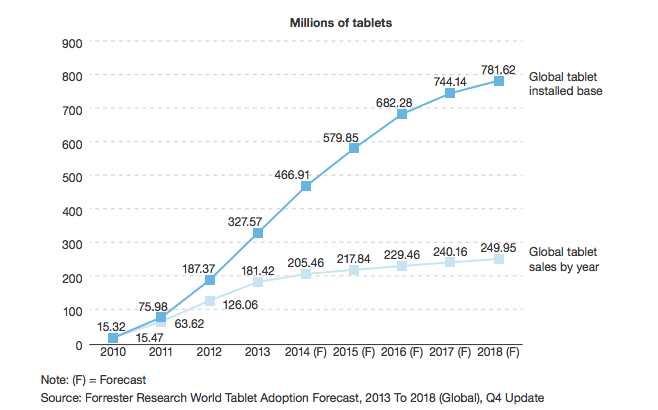 The study points to an overall plateau in tablet sales worldwide. The reason for the slump in sales is varied, but saturation in the consumer market may have a lot to do with it. Android tablets have plummeted in price – some to even as low as $50 – making this an incredibly accessible piece of technology for most consumers. Tablet sales skyrocketed from 2010 to 2013 as Apple, Samsung and others introduced these new pieces of innovation to the market. However, tablet replacement rates are not the same as replacement rates for smartphones. And, as was pointed out in the study, earlier versions of these tablets don’t differ much or offer radically new “must-have” features in the latest models, at least not enough to get consumers to shell out $500 more for a newer device when their old tablet works pretty much the same. The rise in phablets also has something to do with the lower sales figures. Consumers are using these hybrid devices as a substitute for the bulkier tablets. Around 41 percent of global information workers said their primary smartphone is 5 inches or larger. And 11 percent indicated that their primary tablet is actually a phablet, according to the Forrester study. Notably, the Galaxy Note 4, a Samsung phablet that debuted last fall, hit 4.5 million units sold in just the first month out. Meanwhile, Samsung’s tablet market share slipped five percentage points to 17.2 percent in the second quarter. Apple’s larger iPhone 6+, and Microsoft’s Lumia 1520 also played a part in plummeting consumer tablet sales last year. However, there may be an upside to the news. According to Forrester Research, tablets are becoming increasingly critical for business. More than half of employees use a tablet for work purposes at least once a week, the study says. While those aren’t near the same numbers as laptops and smartphones, it shows a critical presence. Employees seem to be using these tablets as a supplemental device to their PC’s and laptops and are likely to bring their own tablet with them to work if their company does not provide them with one. However, Forrester data also suggests companies are more willing to provide these devices and that nearly a third (29 percent) do provide tablets to use for work. The choice of operating platforms and devices used in work situations is complicated, but Forrester prognosticates that tablets will continue to become increasingly important over the next five years. Tablet makers who recognize this could break out of the consumer sales plateau and continue to see profit in this area. Though it takes a smaller share of the market, Lenovo had one of the few tablets that continued to grow, compared to 2013 numbers. Part of that may have been the larger screens and focus on productivity solutions – something that would make a business-centric market more interested in purchasing.